We had a client submit some material for us to make some flyers with. The flyers were going to advertise an upcoming classic car show. As we scrolled through the content that was submitted we quickly realized that the cars were lacking some shine. None of them had been cleaned prior to the pictures being taken, and none of them looked worthy of being plastered on the front of an advertising flyer. Now whoever took those pictures should have gotten some car detailing tips from these guys, because it was obvious that the vehicle had not been detailed prior to the pictures being taken. So that leaves us with the question, how do we fix this in post production? How do we quickly take pictures of cars that don’t sparkle and give them that Photoshop makeover so they are ready to advertise and promote the events the customer wants them too? Well, there are some very simple photos techniques that can be used to add detail to a car photo, and there are tools to mask blemishes and remove unwanted dents and background noise. 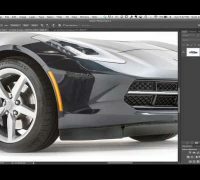 Most of these processes are universal across photoshop, but with a car there are a few quick and easy things you can do and I am going to let Scott Kelby take the wheel on this one. I was browsing through youtube videos to see what the other guys were doing that had a little more Photoshop experience with cars than I do and I came across his blog that featured this great video. Take a look at the video, and leave Scott a comment if you find his video to be valuable for you and your project. If you enjoyed the video and found it to be helpful, be sure to jump on over to Scotts channel to like and subscribe to his channel. There are many other great Photoshop tutorials online and here at Photoshoptutorials.us . If you need something that you can’t find on the site just message us and we will either create it for you or find some content that has already been created that you can use as a learning resource. Thank you for visiting our site. There has been a recent surge in barbershops opening around Denver Colorado and we have taken notice of these powerful logos making a statement online. Most of our clients come to us requesting something elaborate, however, our graphic designers would opt for a more simple design like this logo from Frank’s if they had the opportunity to create a logo for a barber shop. When I think of a barber shop I think of clippers, razors, chairs, top hats, beards, and an old school four chair shop in the city. The new shops that are surfacing around Denver appear to be adopting the old school barber shop look and feel. Some of them are offering drinks and cigars and making the experience more of a gentlemen’s experience. So what makes a logo work for something like a gentlemen’s barbershop? In my opinion simplicity is always best, and what Frank’s Barbershop in Denver did is the perfect example. The services offered from shop to shop are pretty universal, hair cuts, beard trimmings, straight razor shavings, and other male grooming services that will differ depending on the guys behind the chairs. Franks is considered the best barber shop in Denver, and this logo that was most likely designed using Photoshop is representing them well, just check the windows on the building where it is proudly displayed. As a graphic designer, I am curious what went into the design process from the artists perspective. We have to imagine that there were design concepts that were conceptualized and submitted by the marketing team or direct from the owners. It could have been an exact match of what we see, or it could have had some additional aspects to it that we are unaware of. However this logo came to be, both the graphic artist behind the design and the ownership that approved of it should be applauded for their decision making. The logo is simple, yet elegant, and screams sophistication from an era that has long past. The days when gentlemen roamed the sidewalks of downtown Denver with top hats, pin stripe suits, and were polite to the ladies that walked by. This logo design reminds me of that era, and when I visited the website and had a look at the interior, the vision was complete. Personally, I’m not sure if they could have conceptualized a logo that could have made a statement any better than this one does. It tells a story, it’s simple, but yet very complex and compelling. Creating designs like this using Photoshop is quite simple. There are third party plugins that allow you to take pictures and filter them into silhouettes. There is also the option to draw these types of logos out by hand using a sketch pad. If I were to design a very simple mustache that I thought would represent the demographic Franks was wanting to target, I’m not sure I would have done anything different. The execution is perfect, simple design, and a clear message. Something like this could be designed with some of the basic features in Photoshop to create it and exported it with a transparent background as a .png file. They have been using the logo in all their print and media both online and offline. Sometimes simplicity is best, both for you as a Photoshop designer, but also for the client that hired you. Often then perception of a complicated logo design is what many business owners have in mind when reaching out to a graphic designer for work. It’s always easier to make adjustments when your logo design is simple. I think simple designs also tend to get remembered more than complicated designs. The brain just processes them better. This is a good example of a very simple design that has been effective for a business. These simple logos also print very well on things like leather aprons and leather barber rolls for tools.